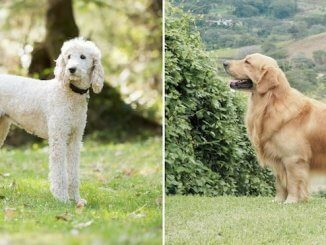 HomeDog BreedsLabradoodle vs Goldendoodle – Which Breed Is The Best Family Dog? Labradoodle vs Goldendoodle – Which Breed Is The Best Family Dog? 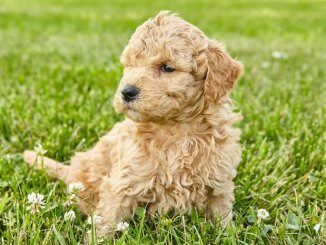 Labradoodle vs Goldendoodle – what is the difference? In short, the Goldendoodle is a result of mating a Golden Retriever with a Poodle. A Labradoodle, like the name suggests, is a result of mating a Labrador with a Poodle – seems simple right? This article is going to focus on the typical Labradoodle (as opposed to the Australian Labradoodle). Have we lost you yet? We will also dig deeper into the different sized Labradoodle vs Goldendoodle and the three different types of Mini Doodles available. Read on to learn more about these equally trainable and sociable pooches, figure out which one is slightly lazier than the other and which is the best family dog. 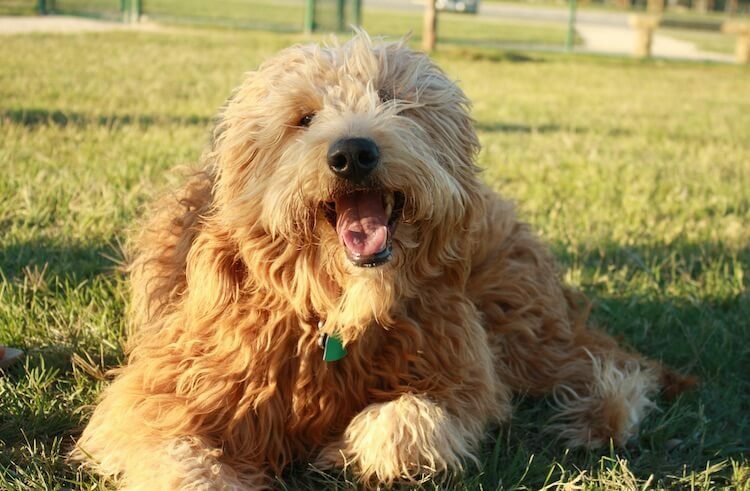 Discover More About These Doodle Mix Breeds: Download a free copy of our pet-parents guide to the Goldendoodle and Labradoodle. Labradoodle vs Goldendoodle – What’s The Difference? The Labradoodle is a Poodle mated with a Labrador Retriever (pictured right) whereas a Goldendoodle is a Poodle mated with a Golden Retriever. 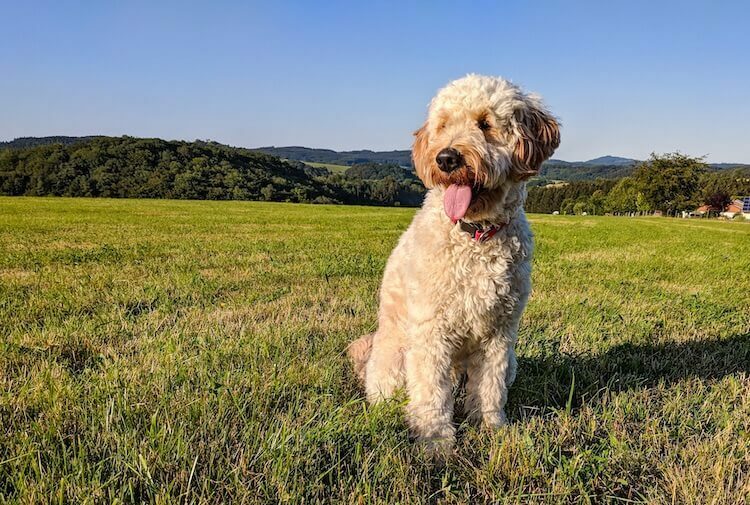 It’s not surprising that so many people research the Labradoodle vs Goldendoodle with regards to their appearance, temperament and trainability. As these Poodle Mixes are hybrids, neither are recognized by any Kennel Clubs, but, both have been recognized by the International Designer Canine Registry since 2009. Both mixes originated in the US, they were bred to be loving, even-tempered family companions and service dogs. The Labradoodle and Goldendoodle both have a poodle parent, so let’s look at their history in a little more detail. The National Dog of France, the Poodle actually originated in Germany as a duck hunter. Avid swimmers with unfaltering intelligence, they were adored by hunters. They soon found their way into the laps of luxury and were a firm favorite amongst nobility. The Standard was bred down to a miniature, due to their genetic diversity, and eventually the toy appeared in the US in the early 20th Century. 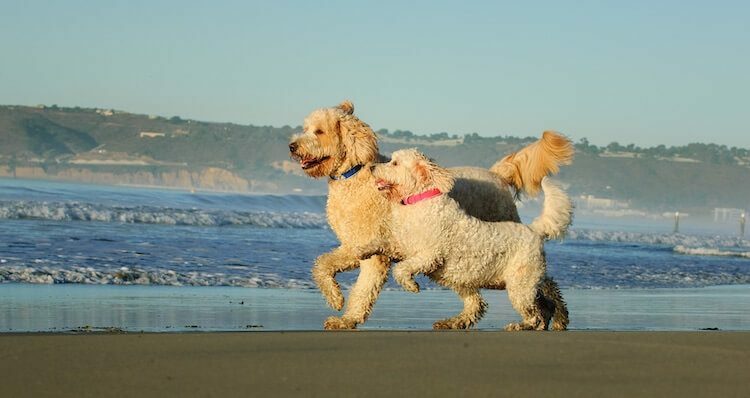 We can thank the Poodles for the varying hybrid sizes when comparing the Labradoodle vs Goldendoodle dog breeds! The other half of the Goldendoodle is the Golden Retriever (pictured above), and last but not least, the other half of the Labradoodle is the Labrador Retriever. Ranked 3 of 193 for popularity by the American Kennel Club, it’s easy to see why we love this friendly and devoted Golden Retriever. However, the most popular dog, according to the American Kennel Club, is the Labrador Retriever; so when comparing the Labradoodle vs Goldendoodle from a popularity perspective, the Labradoodle has a small advantage. Originating in the Scottish Highlands, the Golden Retriever was bred to suit the rainy climate and rugged terrain. Through many generations, the result was a beautiful worker with a sweet and sensible temperament. A Labrador Retriever was the traditional water dog of Newfoundland, they were spotted by travelling English Nobles. They found their way to Britain, where their breed was further refined. Labradors were first registered in the US in 1917, topping the list for popularity in 1991 and has remained there ever since. It’s no surprise that when the parent stock is so remarkable, that we end up with two equally impressive hybrids. So let’s start at the beginning… puppyhood. If you are looking for a Goldendoodle puppy you can expect to pay $600 – 800 USD. For a Labradoodle puppy you can expect to pay between $1,500 – 2, 500 USD. The difference between the Labradoodle vs Goldendoodle price is down to the Golden Retriever and Labrador Retriever. Some puppies come with an even higher price tag. It largely depends on breeder and location. It will also depend on the size of your Doodle. If you choose a miniature of either breed, the price will likely be higher due to the risks associated with mating significantly different sized breeds. On the topic of the miniature hybrids, always ensure that the Mother is the larger of the two breeds; in this instance that will be either the Golden Retriever or the Labrador Retriever. Due to the variety across the two breeds, litter sizes can vary, an average of 8 puppies is often expected by breeders – as always, research a responsible breeder when sourcing either puppy. When comparing friendliness of the Labradoodle vs Goldendoodle, both dogs are super friendly and great for families – so why the different score above? Both breeds are sociable, with people of all ages and when raised with them, pets of all kinds. However, it is noticed, that when the Labradoodle is compared with the Goldendoodle, the Labradoodle can be warier and more reserved with strangers. 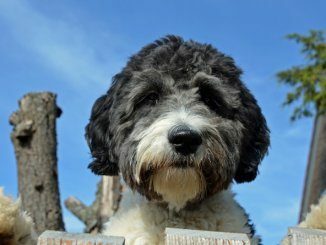 The Goldendoodle, similar in nature to their other Poodle Mixes like the Bernedoodle, generally bounds over to everyone – the Labradoodle, not so much. Hence the lower sociability score for the Labradoodle too. You’ll also notice the differing exercise requirements between the two breeds. Whilst both breeds have working parents, the Goldendoodle is generally calmer in nature and lower energy than the Labradoodle. The Labradoodle loves having a job to do and thrives in an active home. Both ideal family pets, you may find that the Goldendoodle is quieter around younger toddlers and the Labradoodle may be a perfect playmate for the teenagers. Both are adaptable and will fit in with most lifestyles, but, they don’t tolerate being left alone for long periods of time (e.g. more than 4 hours). Poodles are known to suffer with separation anxiety, just like other Poodle mixes too, so it stands to reason it’s a common issue in any Doodle. If you do need to leave either your Goldendoodle or Labradoodle, find a local dog walker to pop in or ask friends or family to help out. Let’s see how their days stack up to see if their needs vary at all. Owning a Labradoodle or Goldendoodle? The Goldendoodle (pictured left) and the Brown Labradoodle (pictured right). Labradoodle vs Goldendoodle Which Requires More Food? Higher energy dogs will use more energy than sedentary dogs, as will those dogs who need the extra energy to keep warm in extremely cold climates. Ensure you are feeding a high-quality dog food which meets your dog’s daily nutritional requirements, specifically his protein and fat requirements. Labradoodle vs Goldendoodle Which Requires More Exercise? Both the Labradoodle vs Goldendoodle, having working parents, won’t be a fan of missing their daily walk. The Goldendoodle is slighter calmer in nature, however both they both suit active homes. Upwards of 60 minutes physical exercise per day with ample time spent training and playing will keep them busy and healthy. Suited to hiking and swimming, they are perfect adventure buddies; but, super adaptable, they are quite happy doing the city thing too, as long as they head to the dog park to play with their friends. Both the Goldendoodle and Labradoodle respond best to reward-based dog training techniques. So when they are behaving how you want them to, praise and reward your dog. Dogs learn through the consequences of their behavior, so, a positive consequence means they are more likely to repeat that behavior. Avoid the use of aversive or aggressive dog training techniques at all costs – they don’t work and further create and perpetuate problematic behaviors. The last thing you want is to turn this, gentle and sweet natured pooch into a stressed and fearful dog. Start training these dogs when they are a puppy, teach them the basic commands and encourage the behavior you want to see. Ignore unwanted behavior when it’s safe to do so. Socialize these dogs as soon as possible – let him meet everything and everyone in the world, in a safe way. When he has positive experiences, he learns it’s nothing to be wary of, this is especially important in the more reserved Labradoodle. Highly trainable, training recall shouldn’t be an issue – but, in busy places it’s always best to keep your pooch on their leash; better to be safe than sorry after all. Hip and Elbow Dysplasia is when there is abnormal development in the joint, causing pain, stiffness and lameness. Patella Luxation occurs in the Mini and Small mixes as it is in the smaller Poodles where the kneecap dislocates. Progressive Retinal Atrophy is a genetic disease found in Labradors and Goldies resulting in vision loss and eventually blindness. Health tests can be carried out on the parents of any potential litters to establish the likelihood of these conditions appearing. 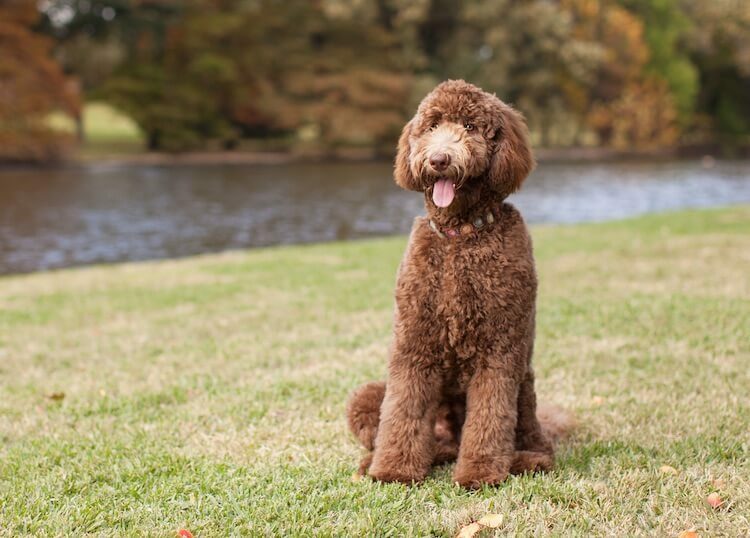 Labradoodle vs Goldendoodle – can you spot the difference? This is the point where you will notice the differences between the Goldendoodle and the Labradoodle. The Australian had Labradoodle and Spaniel mixed in to the earlier generation, so their appearance can be significantly different. 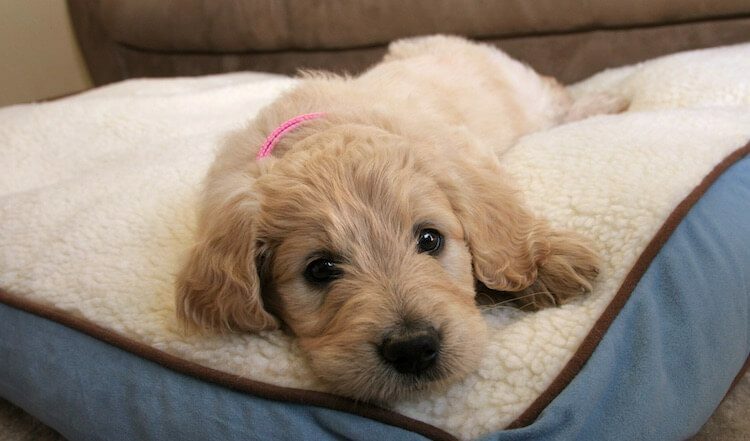 On the whole, Goldendoodles have a longer coat which can be straight, wavy or curly. They tend to only come in the typical golden colors like gold, caramel and red; like the Bichon Poodle. Labradoodles tend to have a shorter coat which can be wavy and wiry. They come in a range of colors including black, red, yellow, white, cream and chocolate. Owners tend to have both the Goldendoodle and Labradoodle clipped regularly by a groomer to keep their coat matt free. Regular brushing is a must to keep their coat in tip-top condition… the Poodle’s predisposition to ear infections means cleaning their ears should be a regular occurrence too. Some people try to decide between the Labradoodle vs Goldendoodle for their hypoallergenic coat. Whilst they can shed less than their parent breeds, being a hybrid, you can never be entirely sure what you will end up with. You could in fact end up with a Doodle who sheds massively, especially if they are first generation mix. Even if they don’t shed, they still produce dander and saliva, both are most common culprits for causing allergic reactions. 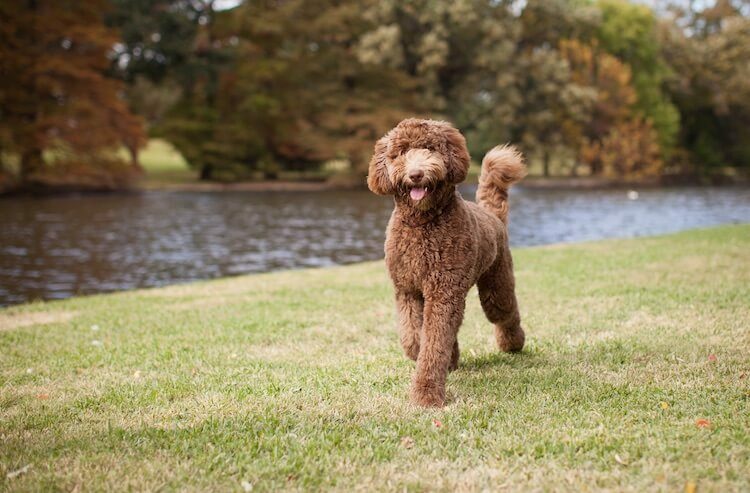 Which dog will you choose – Labradoodle or Goldendoodle? Both being very similar in temperament and personality, choosing between the Labradoodle vs Goldendoodle is a very close call. Both sociable and friendly, eager-to-please and trainable, you couldn’t ask for a better family companion. The main difference is energy levels, Goldendoodles are slightly calmer in nature; Labradoodles are a little more energetic. Labradoodles can also be more reserved with strangers, where Goldendoodles will generally run up to everyone with the same gumption. They both thrive in active homes and will happily co-habit with kids and other pets when raised with them. When all is said and done, it may just be the differing appearance that swings it for you. Let us know which one you prefer in the comments section below. Miniature Golden Retriever: Do These Dogs Exist?